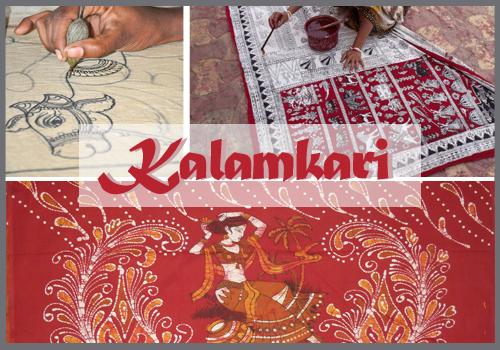 Derived from the Persian Language (Kalam meaning Pen, and Kari meaning Craftsmanship), the Kalamkari proves to be one of the best testimonies of the contemporary Craftsmanship. Being known for Block- printed and Hand- printed designs, this style is universally appreciated for the beautiful amalgamation of the heritage and eligence that it beholds. There are two distinctive styles of Kalamkari work in India, viz., Srikalahasti Kalamkari and Pedana Kalamkari. The Srikalahasti style of Kalamkari work mainly focuses on the borders and the pallu of the saree. Kamaladevi Chattopadhyay popularized this style in India for the first time, as the first Chairperson of All India Handicrafts Board. This style is mostly used to narrate the myths and epic stories on the fabric. It tends to depict religious arts in them as opposed to abstract concepts or patterns. This style enjoys a special place, because of the fact that it is characterized by the manual use of kalam, i.e., pens and other tools to draw the designs and fill in colours free handedly. 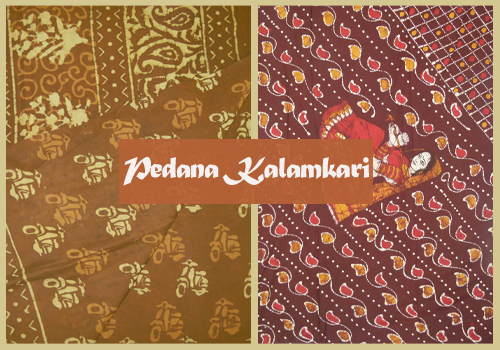 The Pedana Kalamkari, also known as Machilipatnam style of Kalamkari, involving vegetable dyes for block- printing of a textile is produced in Pedana, a nearby town of Machilipatnam from Krishna District of Andhra Pradesh; hence the name. This style of art was evolved during the rule of the Mughal Dynasty and was practiced by the Golconda Sultanate. It involves applying the vegetable dyes on the cloth to make designs using designed wooden blocks. Kalamkari work is mostly seen only in Sarees. But these days we can also find Kalamkari Salwars and Pavadai Chattais Kalamkari work has started paving way to its own unique place in the most leading of trends today. This style of designs on our garbs gives us a unique and vibrant look and is extremely attractive, thanks to the variety of colours and designs, and of course the creativity of the craftspersons.